Telltale Games’ interpretation of The Walking Dead franchise made quite a stir last year. Hailed by many as not only one of the best releases of the year, but as a narrative achievement in games, the studio had huge shoes to fill when continuing the series. The highly anticipated second season may still be a few months away, but The Walking Dead: 400 Days is out now to help tide us over. And while the structure of the stories told prevents the DLC from having the emotional gravitas of the first season, 400 Days still packs that familiar punch. In lieu of the single protagonist of season one, players will pick between five different stories, each of which eventually tie together in various meaningful ways. Characters range from a kid in his late teens to a troubled inmate, but no matter the individual person, each story drops players right into the mix. As with the best segments of the previous season, moments of respite are always signs of oncoming atrocities. If you don’t find yourself in a life-and-death situation, give 400 Days a few minutes. The absolute worst event imaginable is just around the corner. All of this works because the focus remains on the characters themselves – characters the player quickly grows attached to. Thankfully, as The Walking Dead franchise is known to do, zombies tend to play a supporting role. Each chapter – even though most only last roughly 20 minutes – presents realistic emotional drama. Zombies don’t matter nearly as much as the unknown truck heading your way down an abandoned road, or the group leader you just can’t side with anymore. Telltale’s amazing facial animations and down-to-earth character design still create believable people with believable problems. But the scattered nature of the narrative does detract from the story’s overall impact. Or perhaps more specifically, it doesn’t allow for the same impact as the buildup of an entire season. Telltale seems to know this, as 400 Days feels more like a taste than a three-course meal – something to remind us why we liked the first season so much. 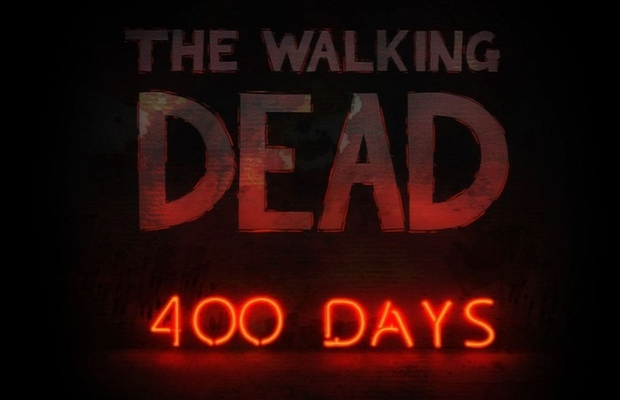 400 Days isn’t groundbreaking, but it’s not meant to be. It’s a greatest hits collection of different types of conflicts found in a zombie wasteland. Completing 400 Days will only take a few hours, but the $4.99 price tag makes that almost a non-issue. The DLC doesn’t try to tell a whole story, choosing instead to provide small effective moments within the greater world of The Walking Dead. One thing’s for sure; after playing 400 Days, I cannot wait for the second season of Telltale’s masterpiece.